When most guests arrive at the wedding reception, their first thought is, “Where am I sitting?” (“And who am I sitting with?”) Easy interaction among guests and great conversation at every table are key ingredients of a successful party. So do ensure both, by planning ahead! 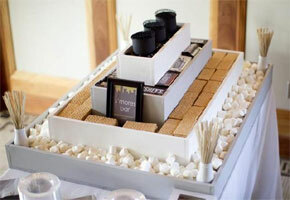 If you are hosting a sit-down event rather than a buffet, a seating chart is the perfect solution. Capture your event theme in a creative seating plan—like this Italian country garden-inspired chart featuring a quaint lattice pattern and leaf border. For our own example, we’ve designed a seating plan for a garden wedding with an Italian inspiration. Our concept is to incorporate clever design accents that echo the outdoor surroundings. First, we chose a large frame and painted it a deep forest green. Inside it, we mounted a stretched canvas (you could opt for plain fabric or textured board instead) to serve as the background. Then for the garden-themed accents, we used chocolate brown satin ribbon to create a quaint lattice-work pattern, and surrounded these with a border of leaf-shaped cutouts. How charming is that! To indicate the guests’ seating assignments, we prepared diamond-shaped cards cut to fit perfectly into the spaces in the lattice design. And the table numbers? They’re made from black felt paper and simply glued in place. An Italian-inspired wedding gets a unified look starting from the seating chart all the way to the reception tables with leaf-shaped place cards. 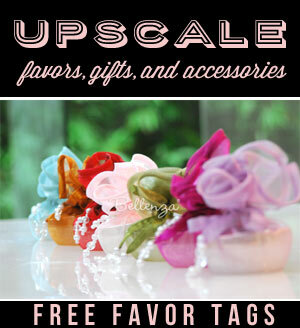 These cards are then attached to the party favors (e.g., ivy embroidered organza bags filled with cookies) for guests. A Destination Wedding in Napa Valley – To designate each table, craft wine bottle cut-outs from lightweight board or card stock. Label these with table names taken from your favorite Napa Valley wines or famous wine regions, such as Bordeaux, Burgundy, Merlot, Chardonnay, Riesling, or Malbec. Below each table name, list the guests to be seated at that table. Then, mount the bottle cut-outs on an elegant frame—or for a charming touch, hang them from a miniature tree or a woody vine decorated with grape leaves! A Beach Wedding in Palm Beach – For a chart with a distinctive nautical feel, have each table cut-out in the shape of a large seashell, starfish, or anchor. Then set the cards on a bed of sand decorated with some rock crystals. Label these with table names based on famous beach locations around the world. Hint: In place of cut-outs, you could use shell card holders or seashell trays to hold cards with the table names and guests assigned per table. An Easter Wedding – In keeping with the “spring is in the air” feel of this occasion, make a whimsical seating chart in the shape of an extra large egg. Then, using pretty ribbons in different pastel hues, tie on cards listing the guests to be seated at each table and marked with table numbers rendered in more pastels. A Modern Winter Wedding – Bring a hip and playful spin to a traditional winter-time wedding with a red-and-white seating chart embellished with crystal snowflakes, peppermint candy canes, and lots of glitter! Name each table after a character related to the holidays such as Frosty, Santa, or all the reindeer (if you’re planning a big party). 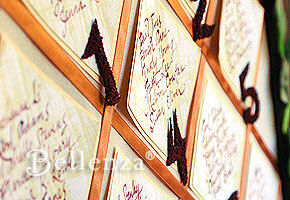 Write these out on cards in a modern font in bright red ink or paint, above the list of guests to be seated per table. Hint: You could also craft the cards as festive red-and-white ornaments and hang them from a miniature Christmas tree or on a holiday garland draped atop the reception table! A Valentine’s Wedding – Play up the romantic ambiance with a seating chart inspired by the iconic “hearts and flowers” of the Valentine season. Prepare a large frame with rose-shaped cutouts mounted on it, each bearing a table number in graceful gold calligraphy and the assigned guests for that table. Or take a more lavish approach: set out a large vase of lovely fresh roses on the welcome table. On each rose, hang a table number cutout paired with a heart-shaped card listing the guests. 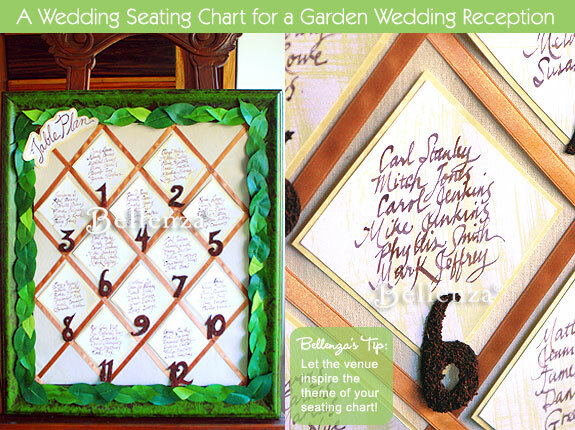 With even simple, but artfully chosen details, your seating chart can be an eye-catching display indeed. Here, paper leaf cutouts create a lush border, ribbons mimic charming latticework, and diamond-shaped cards list guests’ names in graceful calligraphy. How soon should you create your seating chart? 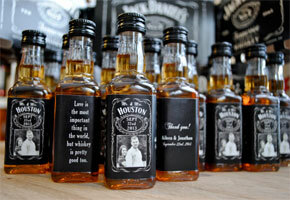 Ideally, your guests should RSVP. But the reality is, many won’t. So go ahead and prepare your frame or diagram early. But hold off on finalizing the guest list per table until two to three days before the event. Solicit the help of your wedding organizer (if you plan to hire one), maid of honor and/or bridesmaids to call, e-mail, or text guests as the date nears. Once you have a list of confirmed attendees, only then can you plan on who will be seated with whom. What are some tips for designing an efficient seating plan? Remember that social events like weddings are rarely the smooth-flowing occasions we envision. So the key is to make the chart or diagram as simple to read and as foolproof as possible. Have the table names or numbers large enough to be visible to arriving guests, and the names written in a clear and legible font. For fancier table assignment presentations—trees, vases of flowers, holiday garlands—things could be a bit trickier! It would be wise to have an attendant (ideally a family member or close friend who knows most of your guests) assist in pointing out the table assignments on the cards. You wouldn’t want a cluster of bewildered guests blocking the entryway! How do we make our seating chart design truly unique? The key is to incorporate unusual or artistic touches into your chart design. Take a cue from your event theme, color motif, venue, or even the season. From these, be creative in selecting your materials, decorative accents, and overall presentation—as shown in our different seating plan ideas above and our actual example garden wedding example. Personalizing your chart to express your style and present special memories is another way to make it truly stand out. Childhood or family photos, meaningful mementos and keepsakes, and table numbers and guests’ names in your own handwriting are heartwarming personal touches. You can plan your chart design to match the overall motif of your wedding. In our example, we used leaves to create the finishing touches. 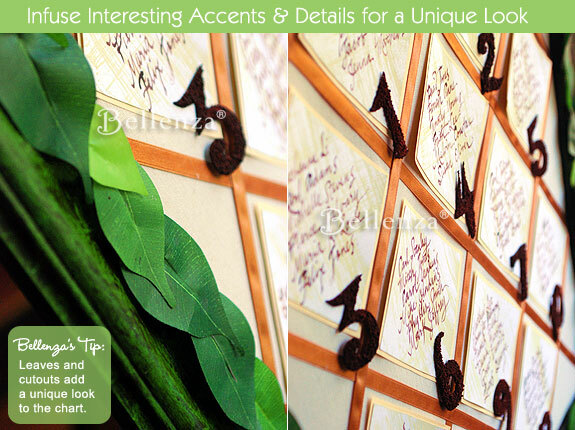 So leaves could be the same motif that appears on your invitations, wedding cake, guest favors, and thank you cards. What are some sources for interactive seating plans or templates? Thanks to online technology, your seating assignments can be easily charted out on Excel or a Google Docs spreadsheet. Using Google Docs is particularly convenient because you can make changes to the document in a collaborative and virtual manner. For instance, if you’re planning the table chart with your maid of honor who just so happens to be in another state or country, then this is the most efficient way to work together. As you assign and re-assign guest seating, Google Docs tracks all changes made on the document and allows you to share these changes back and forth between you. Another benefit is that you can view the document online using your mobile phone, and make last-minute revisions on the go. No need to print (and use precious paper) until the list is absolutely final! Assign to the same table people who know each other well or have some connection. Think cousins, co-workers, former classmates, or neighbors. For guests coming alone or from out of town, help to ease their awkwardness at being surrounded by strangers. Seat them at a table along with guests whom you know to be warm and gregarious, or with whom they may have a common interest, home town, or line of work. If you’ve invited mostly married couples and only a few single guests, do be considerate and assign the singles to sit together with other single guests. Remember! Don’t place a single guest at an entire table of newlyweds, or one with couples that all have children. These arrangements are likely to make them feel a bit out of place. The same goes for seating one elderly guest at a table of young people, or an individual youngster amidst elderly folk. Unless they are related, this could be quite uncomfortable. In the case of divorced parents of the couple, it is acceptable to seat them both at the head table, provided that relations between them are civil. However, if ill feelings may mar the happy occasion, it is probably wise to position “buffer” people in between the parents. For instance, the estranged spouses may be seated on either side of the bride and groom—pairing the mother of the bride and the father of the groom, and the mother of the groom and the father of the bride. Or other special guests, such as the ceremony minister, or members of the wedding entourage may be positioned as “buffers” at the head table. Alternatively, the parents of the couple may each have their own table at which they act as the main host/hostess of that table. As for aunts, uncles, and cousins who have less-than-peachy relations, once again “buffer” people are a safe seating solution. Select individuals who can ease the strained atmosphere at the table by simply being a neutral party on good terms with both sides. But, if still in doubt, you can always resort to completely separate tables for rival relatives! What about seating etiquette for guests? As a courtesy to the host couple and to fellow invitees, guests should never change tables unless absolutely necessary. This could cause confusion and embarrassment should some guests arrive later, only to find their seats taken by others. Besides, the hosts plan the seating assignments with care and concern for everyone’s enjoyment. Switching tables may force some guests into the awkward situation the hosts were precisely avoiding. 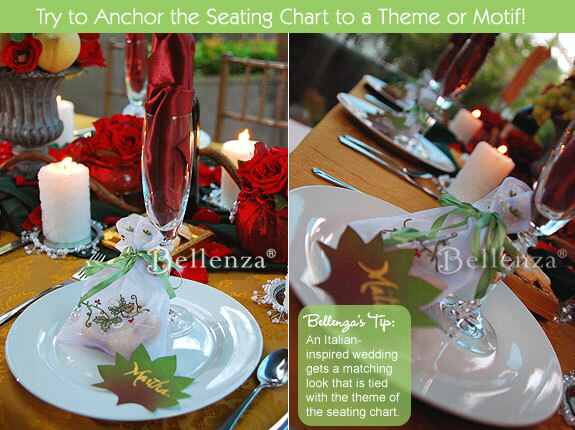 Kudos to Bellenza for such creative seating chart ideas! But even more remarkable is your concern that, beyond the pretty decor, the party is a truly enjoyable and memorable occasion for all. Thanks for caring so much! I’m getting married this summer and it could be stickier for us. Both of us have divorced parents, so creating the seating arrangements will be a bit challenging! Do you have suggestions on how to seat people at a very long weddng reception table? We will be seating 40 people at a Tuscany, Italian wedding however, not sure how to place people i.e. partners sit across or beside each other? Where do the Bride & Groom sit and who would typically sit across from them. For a very long reception table, it is most practical for the bride and groom (side by side) to be seated towards the center of the table. And then you can have the most important guests placed here subsequently depending on their relationship to the bride and groom. These can be the parents, grandparents, bestman, and maid of honor, as well as other close members of the entourage. By doing so, you can also be assured that the photographer can capture everyone together. Moreover, partners are seated across from each other, so that conversation can freely occur. Hi Marla! We wanted to help you out with links to templates. But realized we don’t know what your wedding motif/style will be. So your best bet would be to simply do a Google search. We did it ourselves…we just typed “free printable wedding seating chart templates” and dozens of choices came up! You’re sure to find one you like.